Creamy, sweet, malty, wheat flour. Use as part or all of base malt in wheat beers. Runs efficiently through the brewhouse with slightly higher protein than White Wheat Malt. 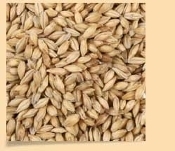 Often used in Hefeweizen and other traditional wheat styles due to a distinctive, characteristic wheat flour flavor. Improves head and foam retention in any beer style.